TAHLEQUAH-Associate Pastor Ed Hale said more than 150 members of First Church prayed, rolled up their sleeves and worked hard to help share the Gospel during a Sept. 9-12 revival. As a result, more than 2,500 people attended the three-day revival and, more importantly, 108 people made a profession of faith. Evangelist Ronnie Hill was the speaker during the revival, with music led by Chris McDaniel. But, it was the prayerful preparation by the congregation which Hale says made the difference. Hill spoke to about 3,500 students at six assemblies held in area schools Sept. 10-11, and students were given “tickets” to come hear him speak that night and eat free pizza. 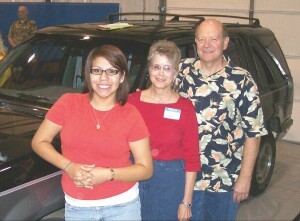 The church gave away a car-a 1991 Ford Explorer-Tuesday night. The vehicle went to Tahlequah High School sophomore Elonka Voros. The car was actually signed over to Voros’ grandmother, since she was under 18. Hale said the church baptized every night of the revival, with a total of 14 new believers baptized during the revival and four more the following Sunday night.